This post is sponsored by Turdlebag. I am being compensated for helping spread the word about Turdlebag dog waste bag holders, but Rubicon Days only shares information we feel is relevant to our readers. Turdlebag is not responsible for the content of this post. We have many different kinds of bag carriers that clip to leashes or belt loops, but when The Ginger Sisters do their "business," I'm always stuck with a stinky green bag swinging at my side. We are lucky to have many waste bins placed strategically around the complex, but if we venture farther afield the options for pitching the offending parcel grow scarce. 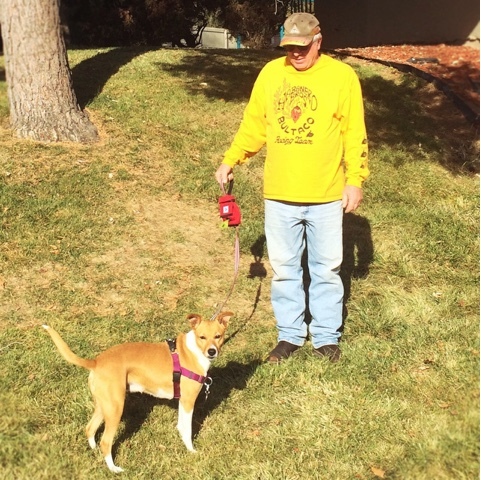 My dad - who joins us for walks but leaves all bagging duties to me - cracked me up recently by telling me that it's more embarrassing for men to pick up and carry dog poop. He may be right, because I can't remember the last time I was embarrassed by cleaning up after my dogs, unless you count the mortifying occasions I've been caught at the end of a roll. At least when my neighbors see me with the telltale bundle, they know I'm not one of the rude people leaving their dog's mess on the lawn, lurking under the newly fallen leaves. 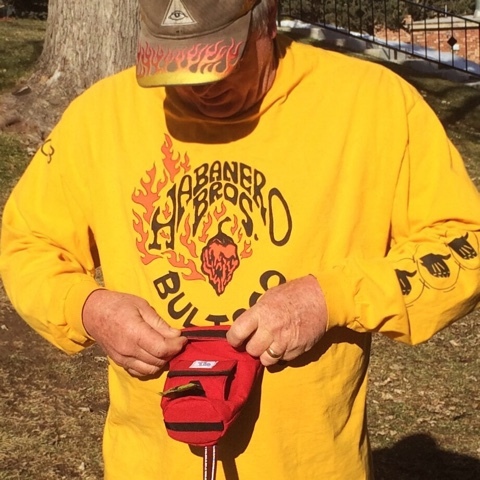 My dad was a great sport about trying the Turdlebag, which turned an awkward chore into a more dignified task. He said he would no longer be embarrassed by Boca's call of nature, since it could be swiftly tucked away in the sturdy Turdlebag. It's so important for pet parents (and pet parents' parents) to set a good example in the neighborhood to ensure our dogs can continue to enjoy public spaces and hopefully be permitted in more places. The Portland, Oregon company seems to have thought of everything when it comes to picking up and packing out what our dogs leave behind, with practicality and a sense of humor. The bags come in three colors to match almost any dog-walking ensemble. 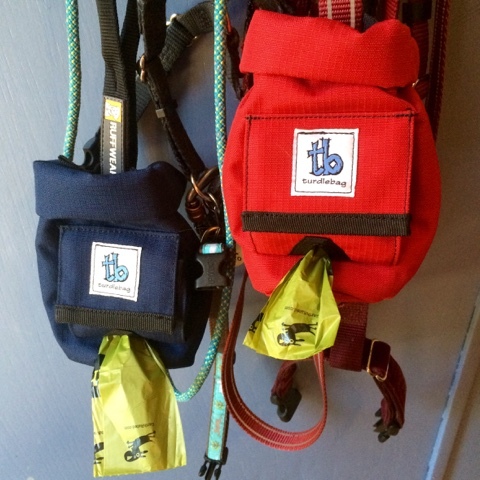 The red matched Boca's harness and leash while blue fit for Ruby. Leashes are passed though an elastic sleeve on the back of the bag and then secured again with a snap so the bag doesn't flop around. The wide opening at the top of the bag accommodates its expected contents (one Turdlebag could hold at least two pit stops from my small and medium dogs), then rolls and clips closed until you are ready to dispose of it. The handle on the bottom allows you to empty the bag directly into a bin. The bags dispense smoothly without unspooling into a poop bag banner as I've had happen with other holders, and the Turdlebag is machine washable. 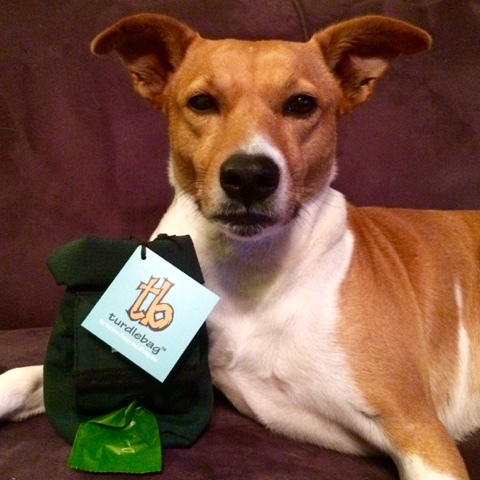 It's hard to forget you're carrying a bag of dog poop when it's dangling conspicuously from your hand, but Turdlebag puts it out of sight and out of mind until you reach your disposal destination. They transformed us into happier picker uppers! 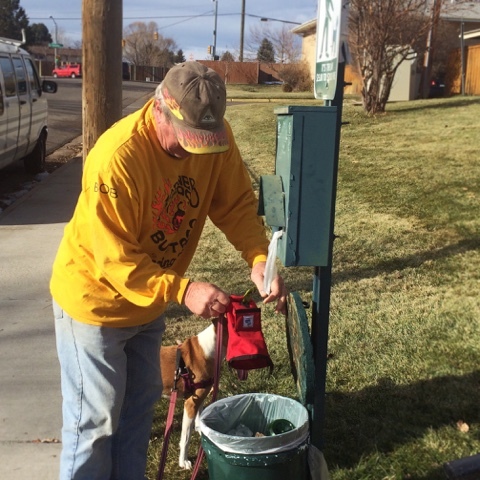 We have dog waste stations at fairly short intervals on our usual route close to home, but I think the Turdlebags will be great to have on hikes. I don't want to be that person who leaves their bag on the side of the trail - meaning to retrieve it on the way back - and I look forward to having these on outdoor excursions next summer. Turdlebag is offering one bag in winner's choice of color to one lucky reader. Entrants must be U.S. residents and respond to notification email within 72 hours. Additionally, from December 5th to December 20th, 50% of all sales at the Turdlebag store will be donated to 501c3 animal charities! The Turtle bag looks so neat!! I am with you! It's not embarrassing until you run out of the roll! I try to carry extras in my pockets and I generally end up washing those extras, too! HAHA! Love the pictures!!! This product is such a great idea. I'm always looking for something that I can tuck a poop bag into when our dogs poop long AFTER the trash big and long before the next one. When I'm walking four dogs, juggling multiple poop bags isn't easy. I usually just tie the poop bag to the end of my hiking stick's strap. I know it looks silly - but at least I don't have to smell it! Plus, I double bag. Nothing can ruin a hike faster than smelling poop the whole way! I long for the day when it becomes more embarrassing to NOT pick up after your dog than to carry a full poop bag around. The Turdlebag would be so helpful with my new service dog in training foster. He loves to try to grab at the bag and this way he couldn't tear the plastic one. I've been using the Turdlebag for well over a year now and I'll never go back to the plastic roll holders. The best thing about it is that you can't smell the poop once the Turdlebag is closed! The roll dispenser is also so roomy that it will hold two rolls which keeps your from the embarrassing problem of hitting the end of the roll and a bag short halfway through your walk. I don't have an embarrassing story, but I am always scared guests are going to step into poop when they are in my yard. This looks super nifty, for sure. There are a lot of bag dispensers in our neighbourhood, but there aren't a lot of trash cans (why you'd ever have one without the other I'm not sure, but, oh well) and this would be a great solution. Ha, no embarrassing story but this product looks great! No embarassing story, but always afraid our guests will step on dog poop in our yard when they come over. This would come in handy, especially for long walks! No embarassing story to think of. This would be so great for walks! Used to be a professional dog walker and this would be great! 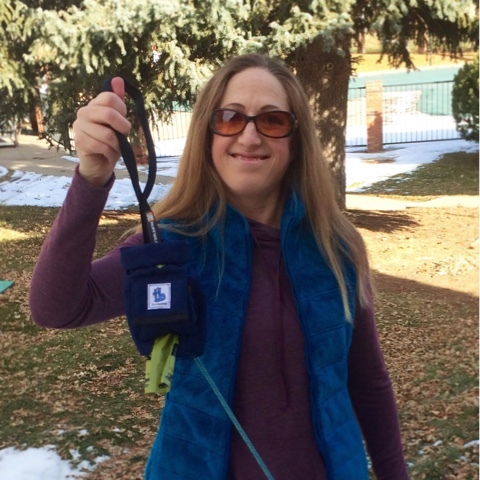 Leaving the house with just one poop bag ad walking 2 dogs! Trying to get 2 poops in one bag made me cough and gag!